The Global Volcanism Program has no activity reports for Fueguino. The Global Volcanism Program has no Weekly Reports available for Fueguino. The Global Volcanism Program has no Bulletin Reports available for Fueguino. A group of andesitic, columnar-jointed lava domes and pyroclastic cones up to 150 m high on Isla Cook mark the southernmost Holocene volcanoes of the Andes. The volcanoes, known as Volcán Cook or Volcán Fueguino, occupy a broad peninsula forming the SE end of the island. One of the cones, S of Bahía del Volcán, contains a 150-m-wide crater with a small lake. The lava domes and pyroclastic cones, possibly emplaced along N-S-trending faults, are unaffected by glacial erosion that scoured the underlying plutonic rocks. Passing navigators observed possible eruptive activity in the direction of Cook in 1712 and the eruption of incandescent ejecta in 1820. Martinic-B M, 1988. Actividad volcanica historica en la region de Magellenes. Rev Geol Chile, 15: 181-186. Puig A, Herve M, Suarez M, Saunders A D, 1984. Calc-alkaline and alkaline Miocene and calc-alkaline recent volcanism in the southernmost Patagonian Cordillera, Chile. J. Volcanol. Geotherm. Res., 21: 149-163. There is no Deformation History data available for Fueguino. There is no Emissions History data available for Fueguino. 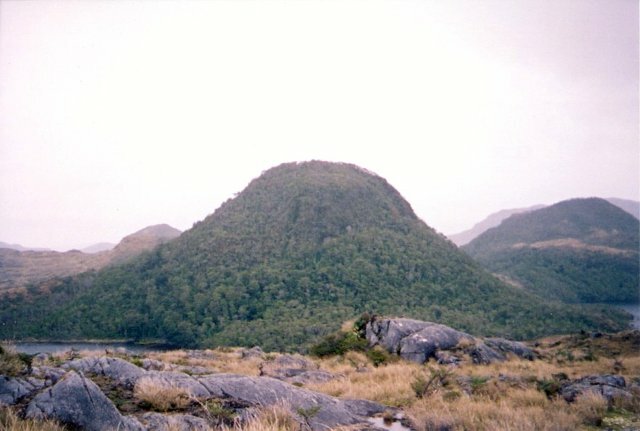 A young lava dome on Isla Cook is viewed from the east. This group of andesitic lava domes and pyroclastic cones, known as Volcán Feuguino or Volcán Cook, mark the southernmost Holocene volcanoes of the Andes. They occupy a broad peninsula forming the SE end of Isla Cook and are unaffected by glacial erosion that scoured the underlying plutonic rocks. Passing navigators observed possible eruptive activity in the direction of Cook in 1712 and the eruption of incandescent ejecta in 1820. Photo by Scott Dreher, 2005 (University of Durham). There are no samples for Fueguino in the Smithsonian's NMNH Department of Mineral Sciences Rock and Ore collection. Large Eruptions of Fueguino Information about large Quaternary eruptions (VEI >= 4) is cataloged in the Large Magnitude Explosive Volcanic Eruptions (LaMEVE) database of the Volcano Global Risk Identification and Analysis Project (VOGRIPA).